How many of you grow squashes? Last year, I grew about six different squashes. Little pumpkins. Acorn Squash. Sweet Potato Squash. And some other funny sounding name squashes. My neighbor grew them too and complained of the dreaded squash bug. She even showed me one while I was visiting her. They are gray and to be kind to bugs, they are not too attractive. Ms America bug, um, not this one. Fortunately, I did not see any of my own squash bugs, but then again they could have been there under the straw mulch. I just did not notice. Mother Earth News (who I love) sent me an email on how to deal with those suckers this year. Well all gardeners share. Remember it is us gardeners against them–the bugs who eat our hard work. Sorry, after dealing with gross slugs and dill eating amazingly beautiful caterpillars, I am not that charitable these days. 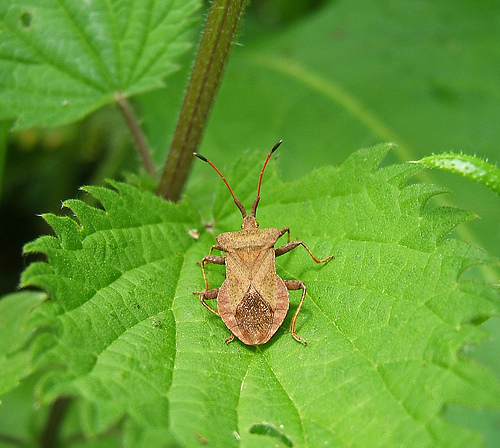 I’m writing today to invite you to try out a technique this summer for squash bug control. If this bug causes problems in your garden, read on. Some years ago, I wrote a report about research done at Texas A&M that found trap crops of early plantings of squash could attract “up to 90 percent of squash bugs in the area.” The key is to plant a few pots of squash indoors, earlier than your usual timing (the bugs are reportedly most attracted to winter squash varieties), then move the plants into the garden as soon as you can. Overwintering squash bugs will make a beeline for them (who knows how they find these plants—bugs are so amazing). The researchers suggested laying a few boards on the ground around the trap crop, and then turning the boards over and squishing the bugs, which like to hide on the undersides. Delay sowing your main squash crops as long as you can, continuing to squish any bugs that show up at the trap crop. Now, we’ve come up with what we think might be an improvement on that technique: a “Squash-Bug Squisher“! Instead of just using whatever is handy to squish the bugs on each board, we expect it would be quicker and more effective if you connected two boards together with hinges, so you could pick up the Squisher, flip it over and slam the two boards against each other. The boards will have to be very flat—we’re thinking that fiber cement siding, which is highly resistant to warping and heavier than wood, might work well. So, what do you say—if squash bugs are a challenge in your garden, why not pop a few squash seeds into some pots this week, and give this technique a try this season? We’ve posted a Squash-Bug Squisher page, http://www.motherearthnews.com/Squash-Bug-Control-Squisher-Trap-Crop.aspx, where you can post your ideas and questions, and eventually, report your results. Did I hear a collective “ewwww” about the thoughts of smashing these bugs? (Okay, I said it.) So, readers, what are your thoughts about Mother Earth News squash bug suggestion? Are you a smasher or a squealer? By the way, did you see that amazing cuke tip for cuke bugs?